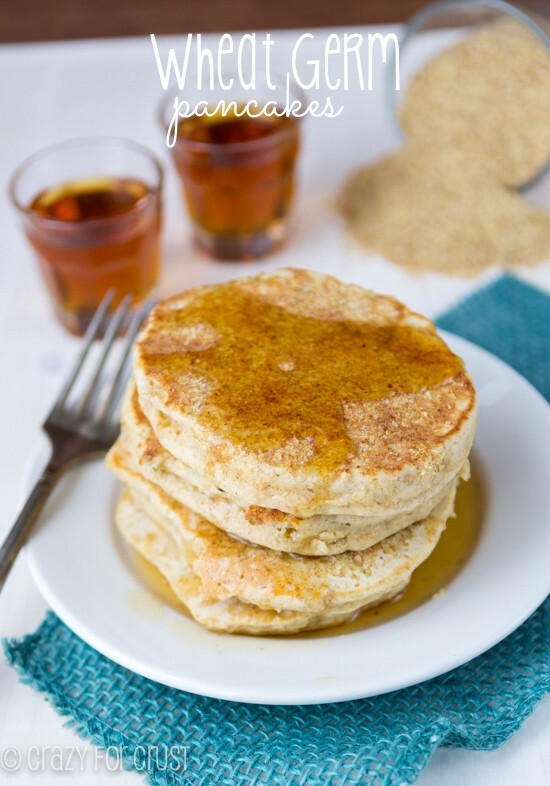 These Wheat Germ Pancakes are secretly healthy and no one will know it – not even you! 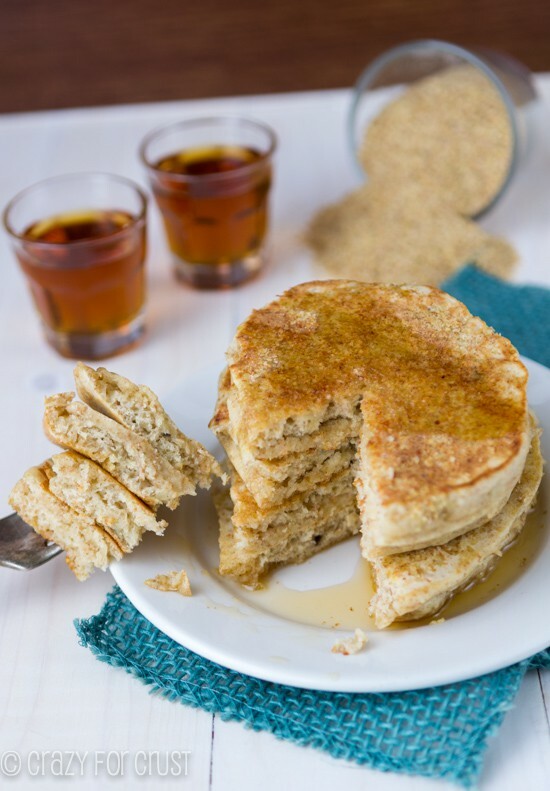 What the heck is wheat germ and why is it in my pancakes? I’ll get to that in a minute. 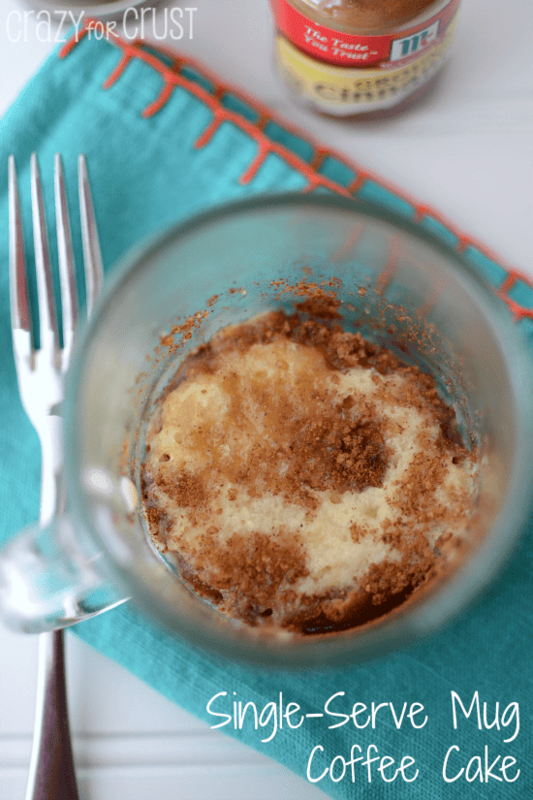 This recipe is actually a copycat recipe, one I’ve been dying to make forever. There’s a breakfast place in my hometown called Stacks. I have no idea if it’s a chain, but their food is sooooo good! It’s right by my old high school, so on Wednesday mornings, when we had late start, we’d all go to Stacks for breakfast. When we were 16 and “kidnapping” for birthdays was popular, (did y’all do that? I think it was the worst birthday idea ever, BTW) we’d drag our friends out of bed and force them to Stacks in their PJs. Then they’d have to go to school like that. It happened to me once but, in true Gilmore Girls fashion, my mom warned me. Anyway, Stacks has these amazing Wheat Germ pancakes on their menu. They’re huge pancakes, as big as plates, and one side is all crunchy from the wheat germ. I doubt those are at all healthy, because they’re made on a griddle, I’m sure with clarified butter or some other really fattening thing. When I made my copycat, I made them healthy. These are the perfect pancake to eat for breakfast, because even you won’t know they’re not bad for you! And your kids will eat them too. Just don’t tell them the crunchy part is wheat germ…or they might go all Jordan on you. Okay, so what is wheat germ? According to Dr. Oz, wheat germ is the most vitamin- and mineral-rich part of the wheat kernel. It’s packed with nutrients that are good for you, like Vitamin B, fiber, healthy fatty acids, and more. 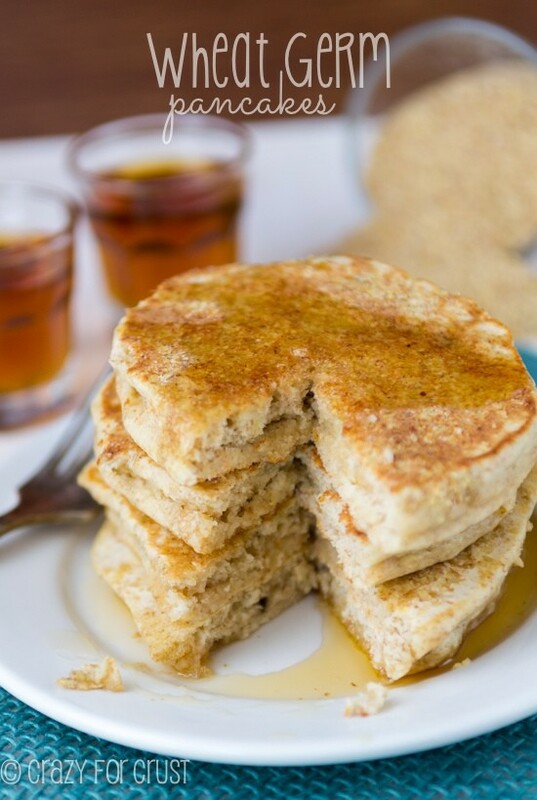 In my effort to show you some recipes that are a teeny bit healthier to help you with your resolutions, I thought these pancakes would be perfect. They are made with a combination of all-purpose and whole wheat flour. While they have oil and sugar, there are only 3 tablespoons of sugar and 2 tablespoons of oil. Feel free to cut down on the sugar, if you like. Instead of non-fat milk, I used unsweetened vanilla almond milk. That saves about 60 calories per cup, BTW. You can use non-fat milk if you prefer, or use soy or coconut. Instead of using all milk, I cut some of the milk with a mashed banana. These are not overly banana-tasting, but it cuts down on the amount of milk you use, and the banana adds some vitamins and natural sweetness. And then there’s the wheat germ. You add it to the pancakes while they’re on the griddle, so when you flip them the wheat germ gets toasty as the pancake cooks. It gives a nice nutty crunch to the pancake. There is also 1 tablespoon of baking powder in these pancakes, so they get super fluffy. I love a fluffy pancake! And I add a little vanilla to them, for a depth of flavor. Plus, vanilla is good in pretty much everything! I love these with syrup, but you can use a reduced calorie or sugar-free one if you prefer. Measure it out, you don’t need much! If you’re using a griddle, begin to preheat. I use an electric one and I set it for about 350 degrees. Whisk flour, sugar, baking powder, and salt in a medium sized bowl. Mash banana in a large measuring cup. Add a little milk and stir them together, then add more milk until the measuring cup reads 1 1/4 cups. (You will use about 3/4 cup of milk). Whisk in oil, eggs, and vanilla. Then whisk the wet ingredients into the dry ingredients until just combined. Spray your griddle with nonstick cooking spray. Ladle the pancakes one by one onto the griddle. Add 1/2 teaspoon of wheat germ to the top of each pancake and cook until the bottoms are brown. Flip and cook until golden on the bottom. Serve with syrup. 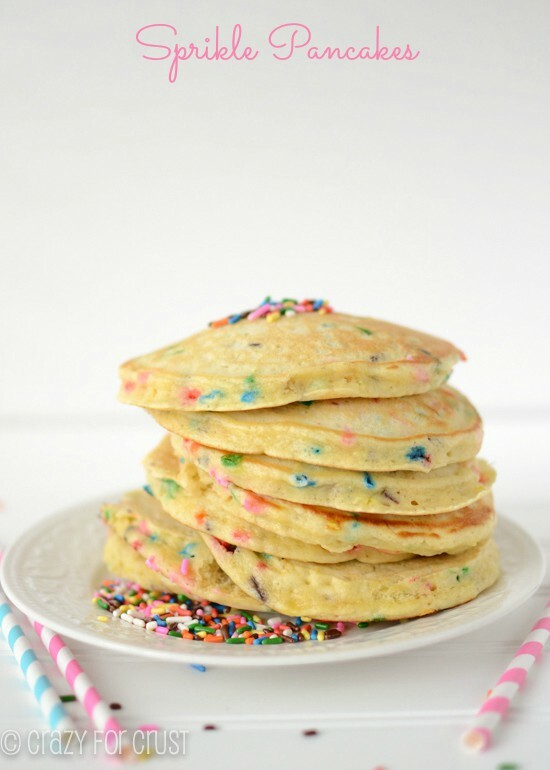 Pancakes can be placed between paper towels and frozen for up to one month. Simply heat in the microwave to unfreeze for a quick breakfast. Oh I’m going to have to try these! I have everything to make them. And what a fun birthday memory! Can you replace the vegetable oil and sugar to make these healthy? If so, what would you suggest? Also, would all wheat flour work – omitting the white flour? I’ve never tried them with all whole wheat, whenever I do that things get funky. But it could just be because I’m not used to doing it. You could definitely cut the sugar down about a tablespoon if you want, or sub honey or even splenda. The oil, hmmm. You need something that will keep it from sticking. You could try coconut oil, I bet! Let me know if you make any subs and how they work out! I couldn’t for the world of me figure out what to do with the wheat germ I bought months ago, but this sound perfectly delicious! They look great! Totally love your pancake. Most fluffy pancake I’ve ever had. I’ve tried several recipe and looks like your proportions result in the best pancakes I’ve had. It does have a strong banana taste but that’s ok. Because of you, I’ve learned about wheat germs. I bought the raw wheat germs and roasted it myself on the pan before using it on the pancakes. Thank you for a wonderful recipe. I’m pregnant and was craving some healthy pancakes. This recipe was super delicious and now I think I may prefer wheat overregular pancakes, not only for health reasons but taste as well. I didn’t have a banana so I used applesauce and added vanilla, cinnamon, and nutmeg with success. Thanks for helping this pregnant woman out and keep up the great recipes. 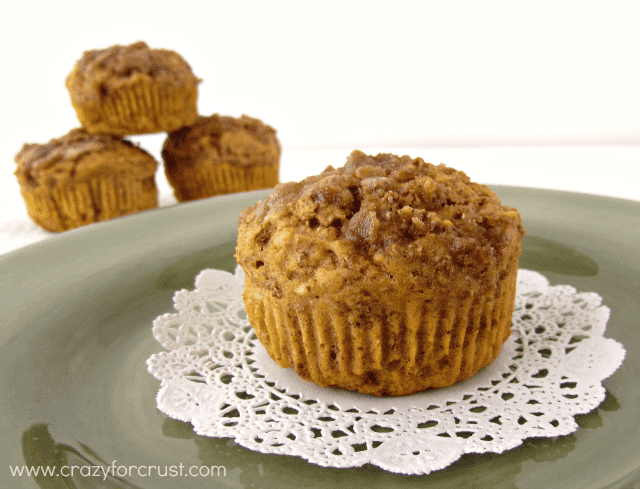 I love the idea of the cinnamon and nutmeg!! So perfect! I loved this recipe! Just out of habit I substituted two tbsp applesauce flee the veg oil and it turned out perfect still. My husband and son absolutely loved them. Thank you! What a great idea!! Thanks for the tip! I used flax seed instead of egg and they turned out great! 1Tbs of flax and 3 Tbs of water for EACH eggso this recipe would call for 2 Tbs of flax and 6Tbs of water.